I think I was surprised as anyone when JCPenney’s announced they were going to a coupon/discount-free based pricing model. In other words, they are doing away with the weekly coupons and just giving the customer the best value. They call it, “everyday low pricing”. Sound familiar? Here’s a few things I know. So, what is with jcp’s model? Have they lost it? According to jcp’s CEO Ron Johnson, he feels the concept will lead to customer’s trusting the department store over all the others. He states their intention of becoming folks’ “favorite store”. Johnson has a pretty successful background: he helped to start Apple’s retail stores. Apple is another store that seems to be using this line of pricing too. They never offer coupons or discounts on their products. And, it doesn’t seem to hurt them one bit. So maybe there is something to not discounting and just giving the customer a fair and value-based price off the get go? Maybe this is the wave of the future in retail? I’m really interested to hear what you think about jcp’s strategy. Do you think it’ll work? Will you spend more or less at a store that doesn’t offer coupons? Why Are Many Rich People So Thrifty? Yes it was all over the SEO forums. Apparently they were doing aggressive link building leading up to Christmas. I think their strategy was to remove those shady links after the holidays. Google wasn’t too fond of this strategy and penalized them and some other high profile sites. They might’ve had to hire some new marketing help which may have contributed to this new move. I think this new strategy has pros and cons. When a store is covered in discount tags it gives a store a cheap feel. Also it would lead to people avoiding buying the stuff that isn’t on special. With the coupons, they may have had to increase pricing on those items to compensate, resulting in mostly the minimal profit sales. 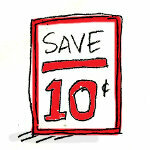 Couponers might even avoid going to the store if there aren’t any coupons that appeal to them. On the flip side, it might make the more frugal people think that they aren’t getting as good a deal. Without that coupon or discount sticker, they are not being assured that the price is indeed low. It makes choosing particular products tougher too as you wouldn’t get guided to pick a certain product by the discounts. I suspect this may have been mostly just a publicity move to try to recover some of the search engine rankings they lost after getting penalized on google last year. They got penalized on Google? Huh – never heard about that. I think the new JCP commercials are really annoying…the women screaming. It just might turn people away. The new strategy sounds interesting. Most other large department store chains make their customers use coupons to get a great deal, which in a way puts the consumer in the driver’s seat. I visited a JCP store the other day which had already switched to the new pricing strategy, and it looked pretty empty without all the sale and clearance signs everywhere. I felt at the mercy of the store because if I wanted something I had to pay their price, without the option of using coupons. I’m not sure I buy into Johnson’s rationale that it will become people’s favorite store and that they’ll trust the store more. I don’t necessarily trust advertising to begin with, and since I’m extremely price sensitive, I tend to stay away from overpriced department stores.